Rhiannon Lewis has successfully fooled the world and framed her cheating fiancé, Craig, for the depraved and bloody killing spree she committed. She should be ecstatic that she’s free. I really enjoyed Sweatpea (the first novel) so was slightly on tenderhooks when reading this sequel, however, I need not have worried. I wondered how on earth the cliffhanger would be resolved but found the solution satisfying instead of contrived. This novel explores virgin territory- the mind of a pregnant psychopath.I don't think this has ever been done before? The voice the narrator used for the fetus was hilarious and the dark humor just as entertaining as the first novel, although I was disturbed to have made the kill list- yes, I do pick raisins out of my food!.The only reason I gave the story 4 stars instead of 5, is that I felt the middle slightly meandered. Once again we are left on a cliff hanger and I for one, can't wait for the next installment. Sweet Pea is in my Top 5 books of all time and I've been eagerly anticipating In Bloom for so long! Perhaps my expectations were just too high and therefore it hasn't delivered. I kept waiting for something huge to happen but it never did. I missed the hilarious observations Rhi used to make on her co workers from the first book, and I missed the gory, graphic but wittily written murders. I didn't particularly enjoy the baby/subconscious musings in this sequel. Georgia Maguire is one of the best narrators out there though. I look forward to reading book 3 in the future though I'm not quite as excited about it now, having found myself disappointed by In Bloom. An excellent sequel to Sweetpea. Binge listened to this after thoroughly enjoying Sweet Pea, Rhiannon's character develops a lot and i found the ending good. also is it just me or is Rhiannon's still far too relatable? apart from her sexual stuff, thats the only thing that rly sics me out. I hope we will get more of Rhiannon's adventures someday or at least something similar. Serial killer stories in 1st person are such a niche that needs filling and i really really enjoyed this in a way i havent enjoyed fiction for a while. A nice break in between reading Brave New World and Keri 1. As a sequel, this audiobook is just as good as the first. A spicy, vulgar, dark comedy where the main character has bags of snark coupled with absolutely no conscience. A pregnancy only adds to the freakishness. I have one criticism; I want to dive into book three immediately but it hasn’t been written yet. DAMMIT! Fantastic story and great narration, as good as the first. Hope part 3 is in the making. I'm a warped bunny I love these so much! Love this series whole heartedly . Yes I am a wee bit of a warped bunny but I find them so funny, I'm not quite sure what that says about me but I'm left wanting more!!!! The character, story and narration is right up my street. Had the pleasure of chatting to the author in an online book group I belong to and she was lovely with a great sense of humour. Which made me love her books even more. Nothing worse that finding out an author is an arse so it was a delight seeing her reply to everyone's comments and being just as funny as I'd imagined. Loved the first book, loved the second! This is such a well written, original story. There’s so much depth to each character, and Rhiannon is terrifying yet vulnerable at the same time. If you haven’t read the first book, Sweetpea, you must before reading this one. Would highly recommend! So entertaining, so relatable! The narration was perfect and I just couldn't get enough. Wicked! Just as good as Sweetpea. 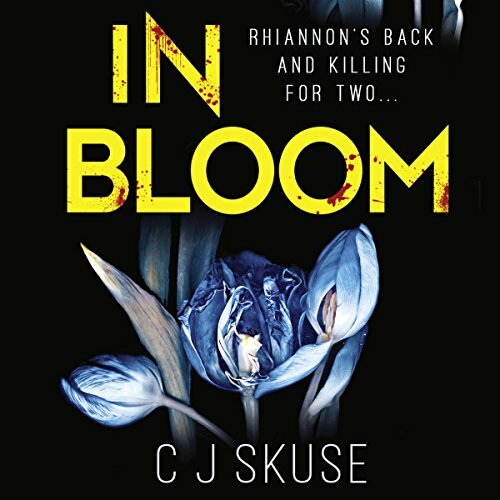 What's not to love about a female serial killer whose fetus acts as her Jimminy Cricket?